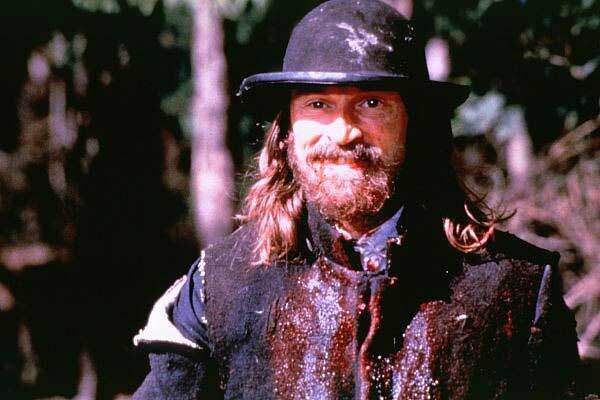 Ravenous is an odd little film. Dismissed upon initial release in 1999 it has picked up a cult following that has made the recent Blu-ray release an event. The film is characterized by a quirky soundtrack, bonkers performances and the famous line “he was licking me!” It is clear to see why this film is so adored. Like most cult classics it has an off-kilter vibe that features performances with personality. Ravenous has a personality all its own and can stand alongside films like Evil Dead, The Warriors and Donnie Darko. Roger Ebert was one of the few critics to appreciate the film and he understood the vibe it was going for. 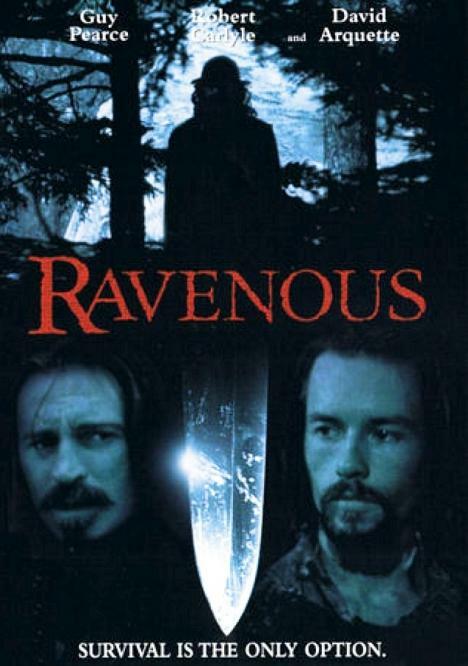 Ravenous” is clever in the way it avoids most of the clichés of the vampire movie by using cannibalism, and most of the clichés of the cannibal movie by using vampirism. It serves both dishes with new sauces. Ravenous can be called a lot of things but predictable is not one of them. It most certainly provides “new sauces” to the mix and those new ingredients are certainly not for the mainstream. From the unique score, rugged locations and A-list cast this historical horror film brings us something new. The film is helped by the cast who fully commit to their roles and it is a blast watching them fight, eat and fight more. The director Antonia Bird jumped into the directors chair two weeks into production when the prior director quit. That maybe explains why it feels like two films. Bird wasn’t happy with the final cut (Studio interference etc..). However, she delivered a film full of memorable imagery and fantastic performances. I’m sure there is a message in there somewhere (Preying on ambition, westward expansion) but what mattered to me was the neat moments. From the opening scene when cowardice is rewarded to the final line “That was very…..sneaky” Ravenous follows the beat of its own drum. Set during the Mexican/American War Ravenous centers around a small outpost in the Sierra Nevada mountain range. One night a starving Robert Carlyle stumbles upon them and proceeds to tell them a story about cannibalism. He tells them there is a woman left alive in the mountains and a motley crew ventures off to save her. Of course, things go awry, people are eaten and it all builds to a massive bear trap. 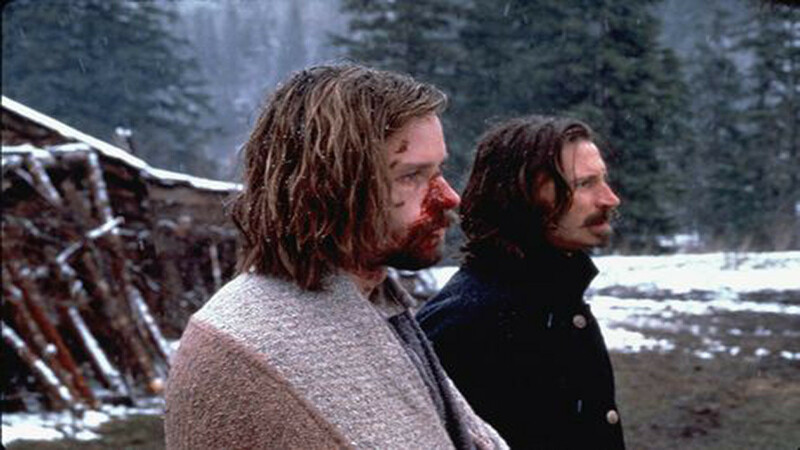 Ravenous is a fun film for genre fans and adds another entry to the cult-classic canon. The material is unique, the cast (Jeremy Davis, David Arquette, Neil McDonough, Jeffrey Jones and John Spencer) fantastic and scenes memorable. It is a under-watched pleasure that you can watch on Netflix and add another cult-classic to your arsenal.